Talon reminded me a lot of Sophie Jordan's Firelight. Obviously the most prominent similarity being that they both revolve around dragons, but it went much deeper than that. Like Firelight, this book sported a star-crossed romance between a dragon and a dragon slayer. Adding to that, the third person in the love triangle was another dragon. There were more parallels than that, but for the sake of spoilers, I'm going to keep them out. Talon was a very entertaining, action-packed, humor filled read. I had high expectations for Julie Kagawa after reading her Iron Fey series, and she definitely met them. I have to admit; I'm always quite wary when it comes to having expectations before starting a book, but I should've never doubted Julie's utter epicness. She always writes books filled to the brim with seat-gripping action, swoony romance, and sarcastic humor. What else could you possibly want? Ember was a headstrong, fiery (pardon the pun), and loyal character. She had a temper and was impulsive, but not overly so. Lately, I've been having issues with reading about characters who are too set on getting their way, ignoring advice from everyone else just because they don't want to be told what to do. There's a fine line between strength and stupidity. Ember made mistakes and raged a few times, but she grounded herself with the help of her loved ones. The love triangle wasn't technically a love triangle....but it sorta was at the same time. We have two contenders at the moment, Garrett and Cobalt. However, despite Ember's attraction to both, it's obvious that her human side has stronger feelings for Garrett. He's the one always on her mind. They gradually fell in love through surfing lessons, carnival rides, and all the other cutesy things they did. With Cobalt, it was more primal instinct than anything else. Their dragons called to each other and when they were in dragon form, they could barely resist each other. What I'm thinking right now is that she'll end up with Garrett. However, there are two major problems standing in their way. One being the obvious "He's the enemy" sort of thing, but really, what's stopped two star-crossed lovers before? In fact, in most YA novels that seems to be the key factor. Impossible lovers = Definite relationship. Though there's also the issue that he's a human...and she's a dragon, a creature that lives for hundreds of years. This isn't Twilight. She can't bite him and turn him into a dragon so they can have a happily ever after. Unless some new secret about Garrett is revealed in the upcoming books, I can't see how they can be together in the long run. Despite the fun I had reading this, the plot wasn't exactly original. Two radical societies hell bent on the destruction of the other. Two people from each society realizing that the world isn't as black and white as it had originally seemed. Later on in the series other people probably begin to realize the same thing, which leads to some sort of revolution and ends in either the abolishment of the old systems or the epiphany that things must change in order for both sides to survive. It's a storyline we've seen thousands of times before, but that didn't lessen my enjoyment of it. It still had me gripping my seat, wondering what was going to happen next. Overall, I enjoyed Talon very much. It was fast-paced, fun, and full of humor. 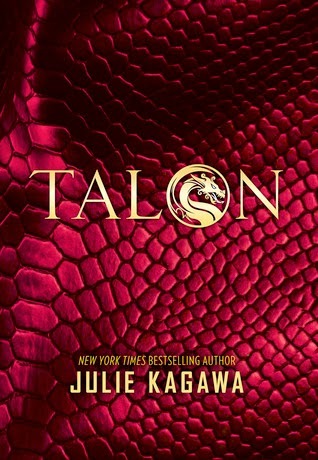 The writing was amazing, as Julie Kagawa's writing always is and the dragon lore that was introduced was explained well. I was never left wondering about what something meant or how something worked, but I'm looking forward to delving deeper into the history of dragons in the next novel. Cover- 6/5 Simple, yet undeniably gorgeous!